My eyes snap open. The room is dark. I’m disoriented. Muffled beeping and soft humming sounds. The hospital. Had the nurse just come in to check my vitals? I wasn’t sure. I had learned in the few days I had been in the cardiac unit that the night nurses seemed to wait until I was asleep to check my blood pressure and temperature. 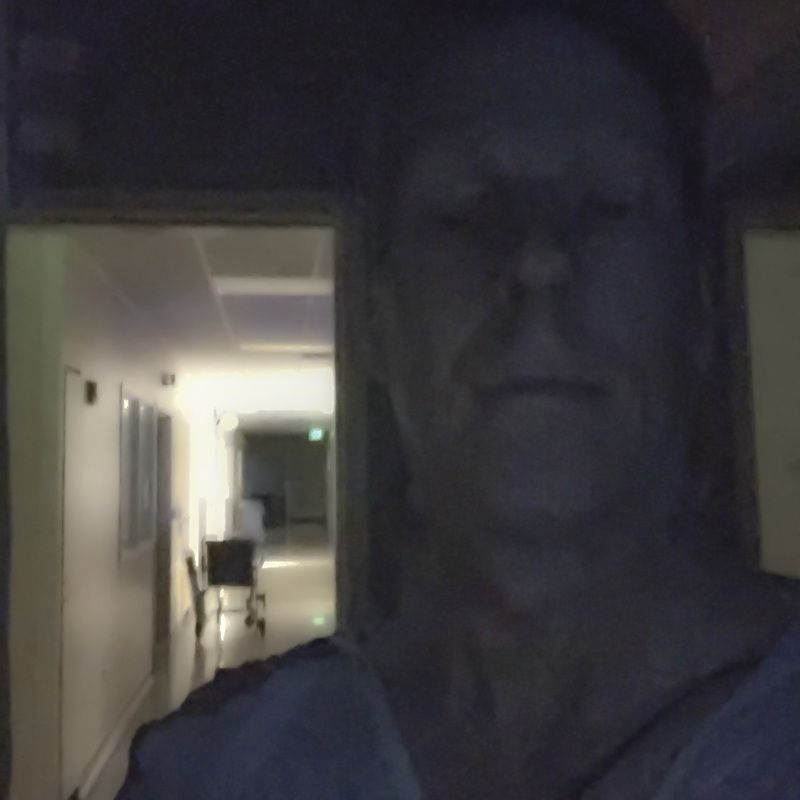 One nurse came in during the night and turned on the bathroom light. The brightness hurt my eyes. I squinted at her. She was staring at me. “I am.” I tried to sound like it. She was doing her best–making sure my heart didn’t stop. The least I could do is be kind. Now, something woke me. I couldn’t see a nurse anywhere. I sat up in bed. My head spun. I swung my feet over the edge of the bed and pulled the oxygen monitor off my finger. I gathered the EKG cables, put the wireless transmitter in my hospital-gown-chest-pocket and let my feet touch the cold tile floor. The coolness cleared my head. I stood up. The room swayed around me, then stabilized. I pulled the drape back and looked out into the ward. 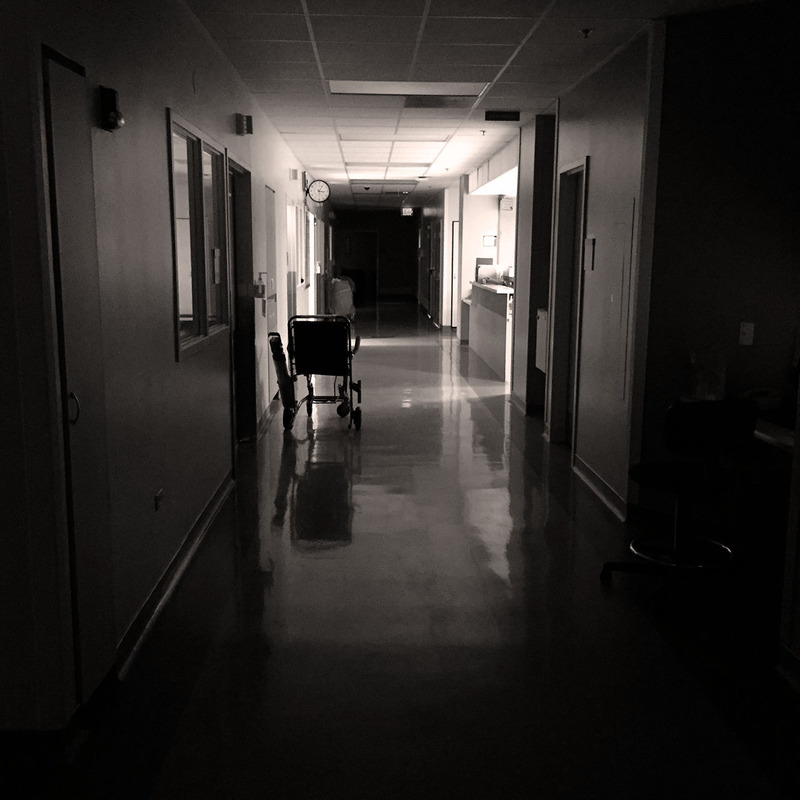 The nurses station was empty, quiet. The clock on the wall read 3:06 am. A wheelchair, empty and still, rested below the clock. Muffled beeps echoed from other hearts synchronized by a desire to continue beating. I did not have a heart attack. Thank God. I put my hands on the treadmill rails as she gathered reams of paper squiggles and hurried from the room. “You failed,” she said, returning a few moments later. “What?” How do you fail a stress test. I’ve got plenty of stress. A week later, an angiogram showed my arteries were clear. My heart was strong. “You have an electrical problem,” the Doc said. “I never liked research papers.” No response. As I lay on the OR table, naked and shaved, the cardiac team hooked me up to all sorts of wires. Twelve-lead-contacts pulsed across a sixty-two inch big screen as a tech joked about alien probes. I shivered. “It’s a bit chilly for that, don’t you think” I said. He chuckled. “We like to keep it cool.” I thought I could see my reflection in his sunglasses. He picked up a sponge and swabbed my neck, chest and groin with glacial betadyne solution from cardiac mountain. I gasped and my body jerked. My arms and legs were strapped to the table. When the Doc arrived, he seemed to speak only in syllables–A-Fib, V-Fib, D-Fib. “Defibrillator,” the Doc said, smiling. My eyes were open. I was back in my room. “Clear,” I said. He didn’t smile. “You have ventricular tachycardia,” he says. His voice is solemn. I nod my head like I know what he’s talking about. He draws a remarkably detailed picture of my heart on the white board and explains. I get it. This time, in the OR, I am able to keep my sweat pants on when they install an ICD device in my chest. I don’t remember much. They sedated me sooner so I couldn’t write about it. Now, at 3:06 am, I’m awake, alone, and left to contemplate my own mortality. I don’t want to die. Although, there are days when I think it might be nice. I don’t like having a device in my chest that controls my heart rate, shocks me if it beats too fast, and communicates by cell-tower with the Doc, and the NSA. I like to exercise. I take care of my body. I eat right. I’m sure I’ve done something of significance in my life, I just can’t think of what it is. I love my wife. I love my children. Would they miss me? I’m not finished teaching them. The drugs they’re giving me make me question my reasoning. By 3:30 am I still have no answers. The incision in my chest hurts. I can’t raise my left arm. I can’t sleep on my stomach. I can’t go to the bathroom. As I drift into awkward dreams of sponge baths and alien probes,I offer a heartfelt prayer to God for help, love and forgiveness. Suddenly, joyously, I feel peace. Then, a bright light speaks to me. You are my peer…but, always have looked up to you !!! Sometimes envious,sometimes jealous, you have incredible amount of grace, wisdom, integrity and dignity. I have always been proud of you…when I haven’t been proud of myself.